A dental implant is an excellent treatment for replacing missing teeth. A root form implant is the most common kind of dental implant. 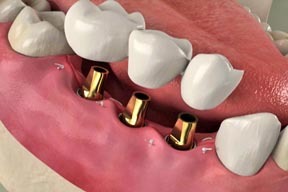 It is a small, titanium post that replaces the roots of a missing tooth. 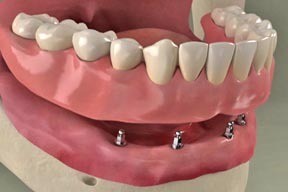 A custom-fitted artificial tooth, called a restoration, is secured to the implant, which holds the restoration firmly in place. With careful homecare and regular checkups and cleanings here in our office, an implant can be an excellent long-term solution for missing teeth. How is an implant used?An implant can support a variety of restorations, such as a single crown, multi-unit bridges, and full arch dentures. Some restorations, like a single crown and most bridges, are not removable. 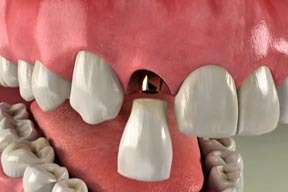 Others, like many full-arch dentures, can be removed for sleeping and cleaning. be possible to place a temporary restoration. Over the course of the next few months, the implant will become securely fused to the bone. The last step is to attach your beautiful final restoration to the implant.